↑ 1.0 1.1 Horowitz, Jason (July 24, 2015). "Bernie Sanders's '100% Brooklyn' Roots Are as Unshakable as His Accent". The New York Times. The New York Times Company. Retrieved February 18, 2016. ↑ "Bernie Sanders". Jewish Virtual Library. American-Israeli Cooperative Enterprise. Retrieved February 18, 2016. ↑ "Sanders, Bernard (1941 – )". Biographical Directory of the United States Congress. Office of the Clerk of the United States House of Representatives' Office of History and Preservation and the Office of the Historian of the United States Senate. Retrieved February 18, 2016. ↑ "Bernie Sanders Biography". Biography.com. A&E Television Networks, LLC. Retrieved February 18, 2016. ↑ 6.0 6.1 "Bernie Sanders' ancestral town in Poland kvells over his Iowa performance". Jewish Telegraphic Agency. February 2, 2016. Retrieved February 3, 2016. ↑ Chana, Jas (August 20, 2015). "Straight Outta Brooklyn, by Way of Vermont: The Bernie Sanders Story". Tablet. Retrieved January 20, 2016. Soltys told them that at the time the Nazis invaded Poland, Romek was the leader of Slopnice's Jewish community. "Which of course," Larry said, "meant he was one of the first to be killed." ↑ Gaudiano, Nicole (April 28, 2015). "OnPolitics: 6 things to know about Bernie Sanders". USA Today. Archived from the original on July 27, 2015. Retrieved July 19, 2015. ↑ 11.0 11.1 11.2 Leibovich, Mark (January 21, 2007). "The Socialist Senator". The New York Times. Retrieved July 18,2015. ↑ "Bessie Glassberg (Goldberg)". Geni.com. Retrieved January 27, 2016. ↑ Sathish, Madhuri (August 28, 2015). "Bernie Sanders' Quote About Hitler Winning An Election Is Powerful. It's Also Misleading". Bustle. Archived from the original on January 21, 2016. ↑ "Sanders Could Be The First Jewish President, But He Doesn't Like To Talk About It". NPR. November 2, 2015. ↑ Kelly, Amita (April 29, 2015). 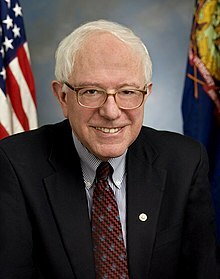 "5 Things You Should Know About Bernie Sanders". NPR. Retrieved July 19,2015. ↑ 18.0 18.1 18.2 Stone, Kurt F. (2010). The Jews of Capitol Hill: A Compendium of Jewish Congressional Members. Lanham, Maryland: Scarecrow Press. p. 483. ISBN 9780810857315. OCLC 755001191. ↑ McCaskill, Nolan D (March 6, 2016). "Sanders: 'My father's family was wiped out by Hitler'". Politico. Retrieved April 15, 2017. ↑ 20.0 20.1 Bump, Philip (January 29, 2016). "The untold story of Bernie Sanders, high school track star". The Washington Post. Retrieved January 29, 2016. ↑ Felsenthal, Carol (May 4, 2015). "Bernie Sanders Found Socialism at the University of Chicago". Chicago magazine. Retrieved July 18, 2015. He graduated from Brooklyn's P.S. 197 and James Madison High School where he was captain of his high school track team. ↑ Smith, Nicola (January 17, 2016). "Bernie ropes in British brother for showdown with Clinton". Sunday Times (London). Retrieved January 22, 2016. ↑ 24.0 24.1 "Bernie Sanders Fast Facts". CNN. August 20, 2015. Retrieved October 13, 2015.